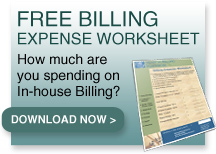 Still Doing Medical Billing In-House? Medical billing can be a demanding and challenging task for small medical practices. For this reason, many physicians or practice managers make the choice to outsource their medical office billing to a professional medical billing company. Medical Billing Resources has been in business for over 17 years and our service has provided over 75 clients with benefits ranging from increased cash flow to reduced accounts receivable. In this ever-changing industry, where physicians are being asked to work harder and longer but for less pay, it is vital that your practice takes advantage of the benefits of partnering with an experienced, knowledgeable billing service. Here are some other advantages of partnering with Medical Billing Resources! With the reduction in overhead costs, the timely submission of medical claims and increased reimbursements, a higher profit is a major advantage to outsourcing to Medical Billing Resources. This allows your office the ability to provide the best quality services using the best technology and products. Patients are becoming more knowledgeable about health care and are making choices based on what services are able to be provided. For this reason, competition in health care has grown quickly over time and to stay in business health care professionals must maintain a competitive advantage. Medical Billing Resources gives you that edge. By outsourcing your medical billing to Medical Billing Resources, you could save thousands of dollars in annual salaries and benefits; office supplies and furniture; and purchasing, upgrading, and maintaining billing software and computer equipment. We charge a small percentage of your net collections. We have a strong incentive to do everything we can to collect for the services you performed. We do this without the need of overtime, sick leave, vacation days, health insurance, and any other employee benefit. 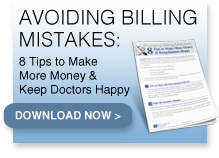 Billing interruptions ultimately affects the timeliness of reimbursements and your cash flow. Again, partnering with Medical Billing Resources allows a continuous, steady flow of claims going out and cash coming in. It is also important that claims are submitted correctly the first time! At Medical Billing Resources, we use claim scrubbers to review claims before transmitting to payers to ensure claims follow every specific guideline. This dramatically minimizes rejections and edits, while, again, increasing cash flow. A steady cash flow is important for your bottom line and the success of your practice. Our experienced, professional medical billers can ensure that your claims are accurately submitted within 48 hours. We have an assortment of Certified Professional Coders, Certified Cardiology Coders, Certified General Surgery Coders, and Certified Professional Coders in Dermatology. This knowledge and experience reduces the number of denied and rejected claims due to billing errors, which results in increased and improved cash flow for your practice. It can be quite difficult to juggle the demands of treating patients and handling billing issues, especially with a small staff. The medical receptionist is responsible for greeting patients and answering the telephone. Reducing the burden placed on your front office staff by outsourcing can increase productivity, efficiency and employee morale. It can also increase patient satisfaction by improving your patient's understanding of his or her statement. Your patients will be happy because they will receive uninterrupted courteous and professional assistance for all their billing questions or issues. Health care is an ever-changing industry. New rules, regulations and requirements are being issued almost every day. One reason that makes medical billing a challenge is keeping up with the changes in Medicare, Medicaid and third party payers. It is a full time job to make sure that the medical office is following the proper protocol required by each payer. Medical Billing Resources stays up-to-date on the latest changes in regulations and requirements to ensure compliance and to ensure the submission of clean claims. Partnering with Medical Billing Resources allows you more time to focus on what you do best - to concentrate on patient satisfaction and to provide quality care to your patients. This is specifically advantageous for smaller physician groups that cannot afford a large front office staff.